Home » Historical Gaming » Might I finally do company sized Vietnam? Might I finally do company sized Vietnam? Most people who have been following this blog and my podcast will know that one of my favourite periods is Vietnam. Up until now I’ve concentrated on Squad/Platoon level actions in 28mm, but this may be about to change. 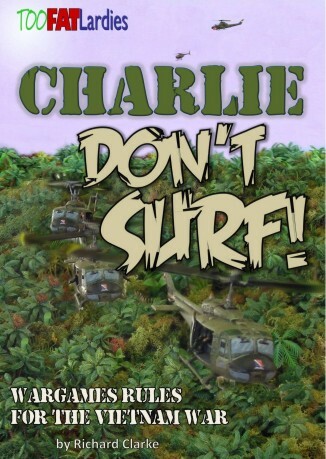 Too Fat Lardies are just about to release Charlie Don’t Surf, a rule set that has been in the offering for what seems to have been an age . This is planned to be a company level game, which may cause an issue as it’s too big/expensive to add to my existing 28mm forces to get a company on each side. However, I have an alternative, and that is to go micro-scale – especially if the game has the basic units of a single vehicle or infantry squad. Oddzials Osmy (available from Fighting 15s in the UK) have recently updated their modern range to include both US Army and VC/NVA from the Vietnam era. Using these figures means that you could fight a company sized action on a maximum of a 4 foot square table, and at a fraction of the cost it would be to play the game in 15mm or 20mm. 1/600 scale certainly isn’t for everyone, but I’m been converted since I painted my Cold War British, so this is definitely an option to do this scale of game in a smaller figure scale. It may mean tweaking the ranges (cms instead of inches?) but it’s an avenue I’m looking forward to investigating.